fit and finish of the appliances need to be of the highest quality. Patient comfort is paramount so the ability to move the jaw laterally as well as being able to talk with the appliance in place is also critical. Adjustability of the appliance is critical in order to meet ADSM guidelines. there must be enough play in the device to accommodate slight errors in impression technique. the appliance needs to meet the reimbursement standard set by medical and federal insurance payors. The clear favorite here at Gergen’s ortho for all of these attributes is the Herbst appliance. The article below was written by David Gergen as a weekly column for SleepScholar.com. 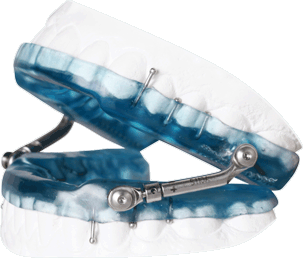 The Sleep Herbst Appliance is a mandibular re-positioning device that has been in use since 1909 in orthodontic and TMJ therapy, prior to its modification for treatment of sleep disordered breathing. 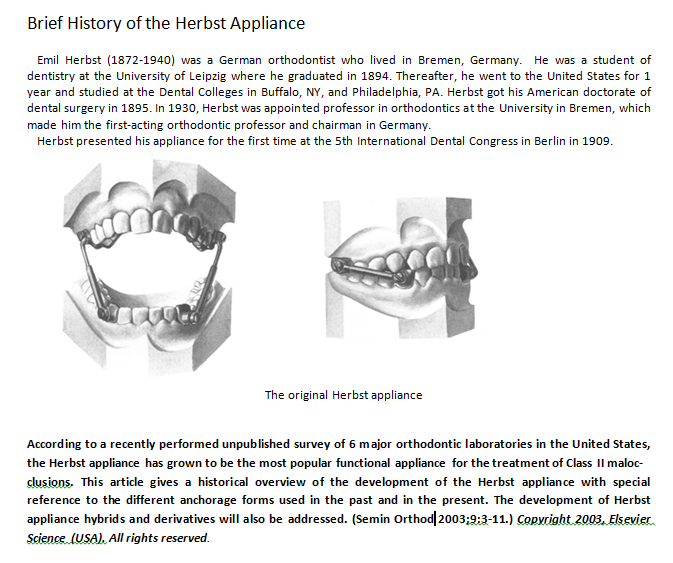 I first learned about the Herbst appliance back in the 1980’s. Dr. Gene Williamson from Atlanta was using it to treat TMJ at the time. Dr. Ed Spiegel began using and teaching the Herbst technique to treat obstructive sleep apnea (OSA) based on reports of successful snoring results for TMJ patients. The Herbst Sleep Appliance has been proven to be effective on chronic snoring and mild to moderate OSA sufferers. The Sleep Herbst Appliance is extremely successful in the treatment of nocturnal bruxism due to the fact it allows patients to move laterally and vertically without disengaging the appliance. It has been shown that patients who suffer from nocturnal bruxism tend to move their jaw in a motion that resembles the figure eight. The lateral movement built into a Herbst allows the patient to move the jaw freely. This movement allows synovial fluid to flow freely through the joint, resulting in less jaw discomfort and/or occlusal changes for the patient. This benefit is not found in monoblock appliances. position. At Gergens Orthodontic Laboratory, we start each appliance at +1 so you can retrude 1 mm. The appliance can be fabricated from hard acrylic, thermoactive and soft materials and is tooth retained via friction grip or clasps. The greatest advantage of the Herbst appliance is that it allows for very quick, easy and accurate mandibular protrusive adjustability. This is accomplished through simple manipulation of the rod/sleeve plunger mechanism. Vertical opening varies, however it is usually 5 mm, there is limited freedom of movement for the mandible in a lateral direction. Bilateral inter-arch elastics are recommended to keep the mouth closed during sleep. A mouth closed posture will allow a lip seal allowing the patient to breathe through the nose or to use CPAP as a complimentary therapy. There is no midline connection on the Sleep Herbst Appliance which helps extremely with claustrophobic patients. Some clinicians feel that limited lateral movement of the lower jaw during appliance use is beneficial for TMJ comfort while others believe it is of no benefit. Also, some clinicians find compromised effectiveness if the mandible is allowed to drop down even as much as a millimeter during appliance use while others find no difference. These are both areas that require more scientific research. We are presently unaware of the precise effect of these parameters on appliance effectiveness. At Gergen’s Sleep Appliance Lab we make more of this appliance than all other appliances combined.